Snake gourd also called serpent gourd is a rapid growing vine of the gourd family. It is a native to southeastern Asia, Australia and some parts of tropical Africa. The whole fruit is eaten as a vegetable. This vegetable often reach 1.5 meters in length. Some health benefits of snake gourd are it prevents respiratory problems, relieves acidity, treats liver problems, treats diabetes and is low in calories. So today am here with a deep fried dish Snake gourd pakoda. We are starting with 95th edition of Blogging Marathon and my theme for week 1 is " Deep fried Love". My family loves pakoda specially Mirchi Bajji ( pakoda ), onion pakoda , brinjal pakoda, Raw banana pakoda and the list goes on. For a change I have made these snake gourd pakoda's, just to try if my kids eat this vegetable in this form at least, as they do not like sabji with it. And to my surprise my kids loved these pakoda's . 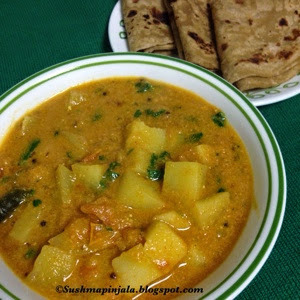 So here goes the list of ingredients and recipe for you to try with your family. Peel the skin of snake gourd and cut in semi thin ( 1/4 inch thickness ) circles. In a mixing bowl add besan, rice flour, salt, chili powder, turmeric powder and carom seeds. In a small bowl add ginger garlic paste and few spoons water to make it watery consistency. Add it to the dry ingredients along with some more water to make it smooth batter. Finally add baking powder and mix. 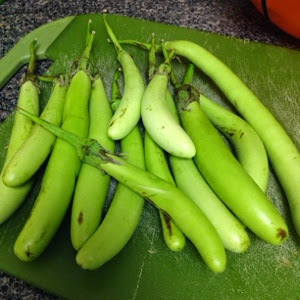 Dip each snake gourd circle in the batter and drop them in hot oil to fry. Fry on both sides till nice and crisp. Add few circles at a time. Remove and place them on kitchen towel to remove excess oil. Check to see what my fellow bloggers are cooking for Blogging Marathon 95. These snake gourd pakoras look so yum Sushma. This is just an amazing way to make kids eat the veggie. Perfect for a rainy evening.. Wish i get that plate of dangerously delicious pakodas rite now, they are just prefect to keep myself warm with the chilled winter evening. I love the melt in the mouth texture of the snake gourd pakoras. Looks so lovely and I am tempted to eat some now. These pakoras look so delicious Carving for some now. I need only a cup of chai to relish these!! yumm!! Interesting bajji with snack gourd. Must try soon. A classic bajji. I haven't eaten this in years now and feel tempting. I’ve never eaten bajji with snake gourd. They sound simple and tasty. Would love to try these some time when I get good quality snake gourd. I’ve never tasted snake gourd bajji. They sound so simple and tasty. Would love to try these out some time when I get good quality snake gourd.